Clicking PDF file links on webpages crashes web browser - how to fix this? Clicking PDF file links on webpages crashes web browser! Just clicked a PDF file link on a webpage opened in web browser. The next moment browser freezes and crashes in attempts to open PDF file link on a webpage. Have you been through this before? Well, you can easily avoid such browser crash by using PDFdownload addon for your web browser like Firefox and Internet Explorer. With PDFdownload addon installed for your web browser, PDF files wont open the way they want to. 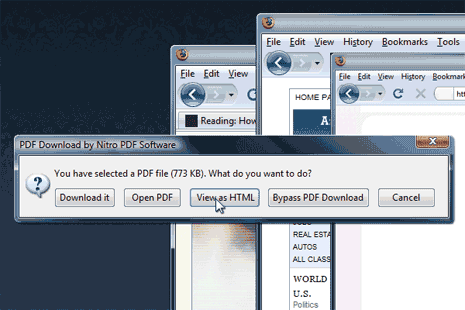 A click on PDF file link will bring a popup menu with options: download, open PDF, view as HTML, bypass PDF download, cancel. You can click through either of option and view PDF file contents without crashing your web browser. It is recommended to use download option, so that you can download specific PDF file and view it separately. Other option can be using view of HTML, if you are only interested in quick read of PDF file contents. Grab the PDFdownload Addon for your web browser and prevent browser crash while trying to open PDF files.